20.10.2015. This summer, the Friedhelm Loh Group joined forces with the Region of Lahn-Dill to run a unique pilot project. Its aim was to equip refugees for the labour market. Building on their existing knowledge, they received basic vocational skills training that opens the door to new opportunities. The State of Hesse has now approved funding to extend the initiative. Speaking in August, Andreas Tielmann, Director of Lahn-Dill Chamber of Commerce, described the Friedhelm Loh Group’s refugee training initiative as a real step forward: “We are going to encourage other companies to follow suit, and to launch their own internships and skills development programmes for refugees.” The Friedhelm Loh Group organised the pilot project in partnership with Lahn-Dill Region to give refugees the basic skills required to qualify for three-year apprenticeships. 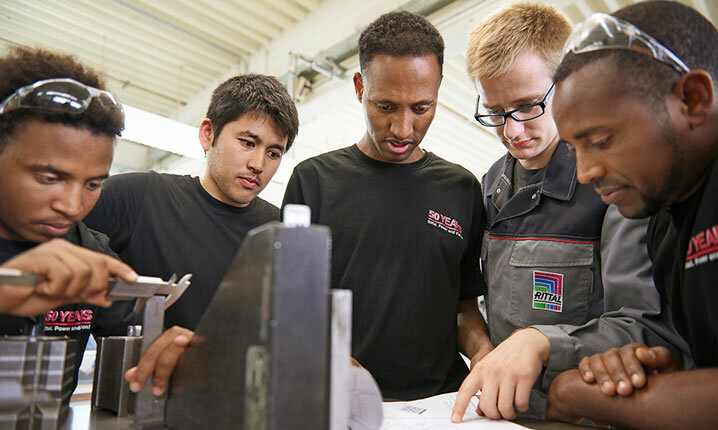 The family-owned company offered three-month internships at Rittal, the Group‘s largest subsidiary, to eight highly motivated young refugees. They were supported by dedicated instructors and mentors, and a German language teacher from the Loh Academy. In July, all eight interns gained the skills needed to start an officially recognised apprenticeship. Two of them took up apprenticeships to train as machine operators at Rittal in September. The intention behind the project was always to pass on the lessons learned to other companies. As Friedhelm Loh himself explains, “We hope our pilot project will encourage other businesses to make similar commitments.” The Regions of Lahn-Dill and Limburg-Weilburg based their funding application to the State of Hesse on the findings from the pilot. Internships should meet the following criteria: selection should be based on a complete profile of candidates’ existing skills, and language courses tailored to vocational needs, together with pastoral support from a personal tutor, must be provided. Funding was approved shortly afterwards, in October – and the extended project, known as the Labour Market Opportunity Project, was born. 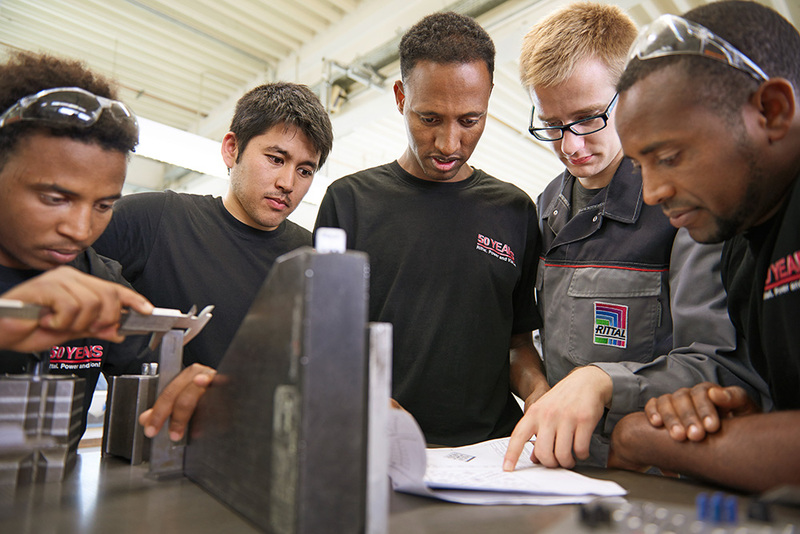 The project, which is organised by the Lahn-Dill and Limburg-Weilburg Regions, offers a model to other companies interested in equipping refugees to take up apprenticeships. “The project is aimed at refugees who are likely to remain in Germany long term,” explains Stefan Grüttner, Minister for Social Affairs and Integration in Hesse. 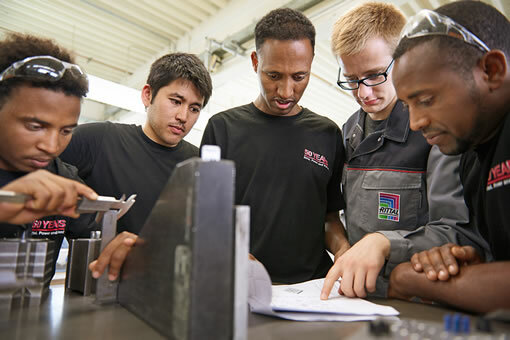 “The idea is to integrate them as quickly as possible into the regional labour market through vocational training courses and apprenticeships.” This would provide skilled workers for local companies in the medium term and at the same time enable refugees to earn a living and contribute to society, he added. The Labour Market Opportunity project is based on three central elements: identifying existing knowledge and skills, tailoring support to maximise refugees’ individual potential, and the provision of learning units at local vocational training organisations GWAB and GAB and at participating companies. Image 1: Trainees act as mentors to interns, to the benefit of both. 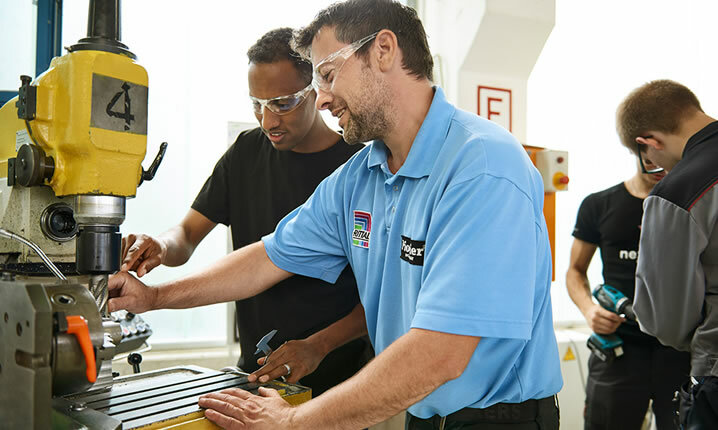 Together, they not only learn how to use drills and milling machines, they also improve their knowledge of the German language – and of football. Image 2: Instructor Jochen Gerhardt shows the interns how to operate machinery.